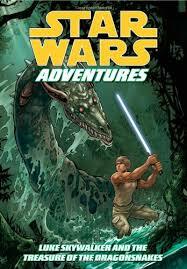 The book series Star Wars Adventures has lots of books and one of them is Luke Skywalker and the Treasure of the Dragonsnakes which is written by Tom Taylor. In this book we join Luke Skywalker and R2D2 as they go to Yoda’s planet which is called Dagobah. When they arrive they crash into the swamp were the King of the Dragonsnakes lives. When Yoda finds them he sends them on a quest to retrieve an object from the Dragonsnakes lair but there will be a hilarious twist at the end. In this book there is more than one main character but the first person is Luke Sky walker. Luke Skywalker is a brave, strong and annoying Jedi that faces his fears as he attacks the Dragonsnake king. Throughout the book Luke annoys Yoda while he teaches him about the force. Yoda is another character. Yoda is the wisest character in the book and is the master at using the force. While you read the book Yoda gives interesting facts about the force and also teaches Luke the way of the force. This book is filled with the best illustrated pictures that help the reader visualize a better image so they can feel like they are right there. This book is filled with great onomatopoeia such as “VRRRMMM”, “AGHHHHHHHHH!” and other action noises. The short sentences make the book easier for kids to read. Throughout the book there is action on every page. The Author wrote this book to entertain kids with an action pack filled story. I recommend this book to children that love action packed books. Kids that are 7 and over should definitely read this book. 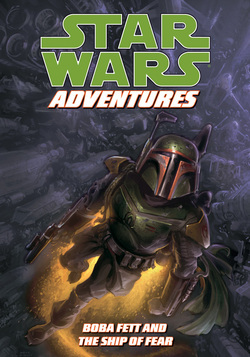 The book series Star Wars Adventures has lots of books and one of them is Boba Fett and the ship of fear which is written by Jeremy Barlow. Boba Fett finds out that he can be rich by finding the Arachedron that’s in the reverie ship in the ship graveyard but it won’t be easy because there will be a surprise waiting for him. The main character of the book is Boba Fett. Boba Fett is a bounty hunter that wears a green clone trooper suit with a jetpack. He is a serious, violent and awesome person because he stays on his missions and kills aliens with guns, grenades and other weapons. This book is filled with the best illustrated pictures that help the reader visualize a better image so they can feel like they are right there. The book is filled with great onomatopoeia such as “Boom! Boom! Boom! Boom! ” and other action noises.The short sentences make the book easier for kids to read.Throughout the book there is action on every page. The Author wrote this book to entertain kids with a action pack filled story. I recommend this book to children that love action packed books. Kids that are 7 and over should definitely read this book.